A late US Army soldier and native Staten Islander will have his memory honoured by a trio of new steel ferries, servicing a route between the New York boroughs of Staten Island and Manhattan. The three double-ended Ollis class vessels are named after Michael Ollis, a staff sergeant in the US Army, who died in combat in Afghanistan in 2013, aged 24, whilst saving the life of a Polish soldier. The trio, reportedly partly funded by a US$191.6 million federal grant, will be operated by the City of New York Department of Transportation’s (NYCDOT’s) Staten Island Ferry Division and will replace three ageing vessels – namely John F. Kennedy (built in 1965) and Andrew J. Barberi and S.I Newhouse (both built in 1981) – that had previously been servicing this route. 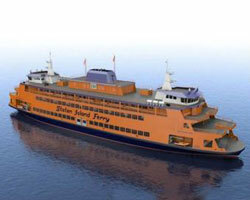 It is estimated that Staten Island ferries typically carry about 22 million passengers annually. The Staten Island-Manhattan route normally takes about an hour for a round trip. Construction of all three newbuilds is underway at Eastern Shipbuilding Group’s 1.2 million m² Allanton Road yard, located in Panama City, Florida, with the debutant, Staff Sgt. Michael Ollis, scheduled for delivery in 2019. This vessel will be followed by the second-in-class Sandy Ground in the same year, and then a third sister, whose name is yet to be confirmed, in 2020. All three are based on designs supplied to Eastern by Washington-based Elliott Bay Design Group, with input provided by fellow Washingtonians Glosten Associates and Guido Perla & Associates. Each ferry will accommodate up to 4,500 passengers, thereby drastically reducing traffic congestion on the streets, tunnels and highways in and around the Big Apple, and will seat at least 2,551 persons. According to Elliott Bay Design Group: “The primary goal was to fit as many seats as possible on the three decks – the main deck, the saloon deck and bridge deck. Additionally, it was desired that the main and saloon decks be at the same elevation as the terminal loading ramps, similar to the Kennedy class vessels which carry vehicles. “Replicating a feature from John F. Kennedy, direct and unimpeded walkways from the loading ramps into the passenger spaces were identified as a means for minimising loading times by providing passengers direct access into the vessel without bunching around the exterior doors.” Meanwhile, the fourth deck – aka the 'hurricane deck' – is reserved for up to 16 crew members and features pilot houses and an emergency generator. Separate stair towers will be located at each end of each vessel. Compatriot engine manufacturer Electro-Motive Diesel will supply each ferry with four of its 12-710 propulsion engines, which are compliant with the US Environmental Protection Agency’s (EPA’s) Tier 4 emission requirements. These engines will feed a pair of 36 RV6 ECS/285-2-type Voith Schneider Propellers – one positioned at each end of the vessel, for optimal manoeuvrability – through Reintjes DUP 3000 P combining reduction gears, Eastern says. This arrangement will grant the Ollis class ferries a minimum speed of 15-16knots, though a sprint speed in excess of 17knots will also enable each newbuild to make up for lost time if it happens to run late on its daily schedules.